The run-down Molenbeek district in central Brussels is at the heart of focus of police investigations into last week's terror attacks in Paris. Abdelhamid Abaaoud, the Belgian national believed to be the mastermind of the Paris attacks, grew up in Molenbeek. Two of the attackers - Brahim Abdeslam, who blew himself up outside a Paris café - and his brother Salah, who is being hunted by police – also lived in the district. Belgium has seen more of its nationals leave to fight for the terror group Islamic State than any other country relative to its population. Claude Moniquet, a Belgian intelligence analyst says Molenbeek is a commune that has been abandoned. There is a radical fringe, he says, not very large, but real, and it has existed for 20 or 30 years. So people settled in Molenbeek who have become sort of leaders of radical Islam not only in Belgium, but also in Europe. In 2001, the assassins of Afghanistan’s anti-Taliban commander Ahmad Shah Massoud had stayed in Molenbeek. One of the main plotters of the 2004 Madrid train bombings lived in the district. In 2014, four people were killed in a gun attack on the Jewish Museum in Brussels; the main suspect had stayed in Molenbeek. And Ayoub El Khazzani – who attempted to carry out a gun attack on a Paris-bound train in August that was foiled by off-duty U.S. servicemen - had stayed in the same neighborhood. security analyst Sajjan Gohel with the Asia-Pacific Foundation. Armed police guard a street in Brussels on Nov. 16, 2015. 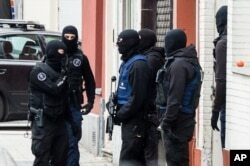 A major action with heavily armed police is underway in the Brussels neighborhood of Molenbeek amid a manhunt for a suspect of the Paris attacks. Gohel said terrorists are exploiting Europe’s open borders. “We are seeing a nexus develop between Belgium and France for terrorist-related activity, and exploited by ISIS," Gohel said. Authorities say they have foiled several terrorist attacks. But pressure is growing on Belgium to crack down harder on Islamist extremism in the political heart of Europe.